Juhlin’s work is about discovery, the hint of possibility. It’s about the layers, the flow and the strata of things substantive, imagined, physical and implicit. Jeff works by accumulating layers of material, images and color that make up the whole of a work, then he goes back in to explore, excavate, expose and obscure. The end result is a non-literal visual form, a translation of that experience and process. "Often we see only the surface of things when in reality there are many layers, artifacts, histories, clues that hint of something curious and magical that might lay beneath the surface waiting to be discovered, excavated, explored and experienced." Jeff Juhlin has completed Residency/Fellowships at the Virginia Center for the Arts, Amherst, VA and the Moulin Au Neuf, Auvillar France. He has recently been an Artist in Residence at the Hui Art Center in Maui, Hawaii. 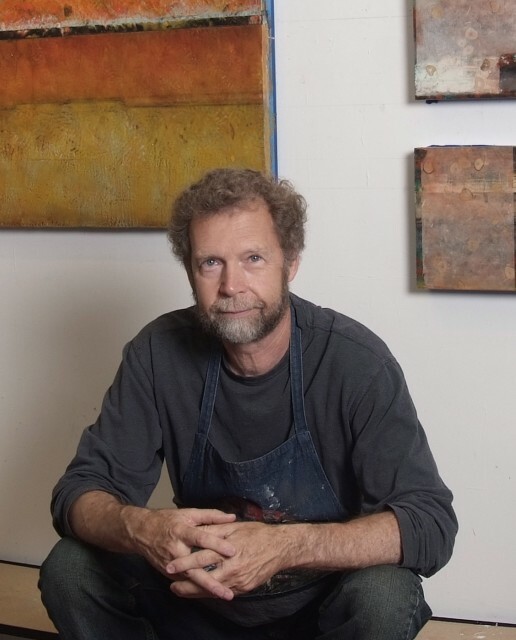 His work has been featured in several publications including Encaustic with a Textile Sensibility by Daniela Wolf and Embracing Encaustic by Linda Womack. Jeff’s work can be found in numerous private, corporate and public collections. Jeff studied at the University of Utah and holds a BFA degree in drawing and painting from the San Francisco Art Institute. He maintains studios in Salt Lake City and Torrey Utah.